Friends and family members attended the funeral of schoolboy George Wharton. It was standing room only as mourners packed a Morley church to pay their respects to a teenager who was killed in a car crash. Hundreds of friends and relatives attended St Peter’s Church for the funeral of 14-year-old George Wharton today. 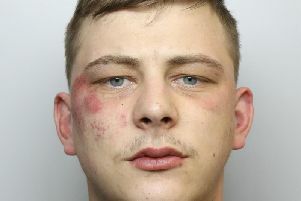 George, from Churwell, died along with friend Rhys Baker, 13, when a car they were travelling in came off the A62 Gelderd Road in Morley and hit a tree on the afternoon of Saturday March 7. Members of the public stood silently outside St Peter’s as the funeral cortege arrived shortly before 10am. Flowers spelling out ‘George’ were visible alongside the coffin. Wreaths were also placed on top. Inside the church every seat was taken, with dozens more people standing at the back. George was a very popular student and will be much missed. Earlier, the whole of Morley Academy, where George was a pupil, came to a standstill as staff and pupils paid respects. About 100 students and staff were at the church for the funeral, but everyone else from the 1,580-pupil school either lined the street or stood silently on the playing fields as the funeral cortege drove past. Academy principal Leanne Griffiths said: “Everybody, without being asked, was incredibly respectful. “George was a very popular student and will be much missed. After the funeral, George’s coffin was taken to Bruntcliffe Cemetery to be buried. A wake was held at Bruntcliffe Working Men’s Club. Meanwhile, the site of the crash has continued to attract tributes to the boys who died. A mound of flowers, T-shirts, candles and other memorabilia has built up in the 17 days since the incident. Two others, Kameron Walters, 14 and Joshua Van Veen, 15, and 21-year-old driver Tom McMeekin remain in hospital after suffering serious injuries.